Tomorrow I am about to buy my first Kayak and am really looking forward to picking one and taking to the many waterways in parts of the UK. I decided to have a joke on Facebook and put up a photo of a cat in a kayak, thinking that someone had surely made one such collage in photoshop. 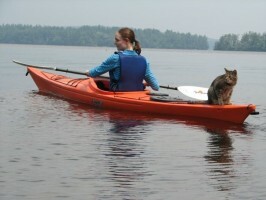 To my surprise many real photo’s came up in a google search of cat carers having fun with their water loving fur balls. Lets start with this kitty having a wonderful time in Halibut Cove. Or how about Pooka the cat in Minnesota.